Daniel (F) on stage with Giancarlo Guererro (R) and the Nashville Symphony. Bright Sheng rehearses Rising Moon. Daniel Temkin (b. 1986) began composing at age thirteen. One of his earliest pieces was premiered in Lincoln Center and he has been a Composer-in-Residence with Music From Angel Fire (New Mexico), Chamber Music by the Bay (San Francisco), and the Intimacy of Creativity Festival (Hong Kong). Daniel's work has been supported by many leading arts organizations including Amphion, American Composers Forum, BMI, the Alice M. Ditson Fund, Earshot, the Theodore Presser Foundation, and others. Daniel is particularly recognized for his orchestra music. 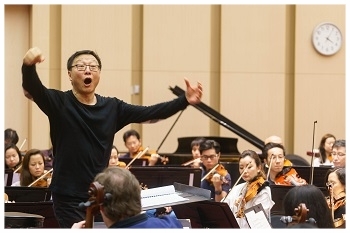 In 2016, MacArthur Fellow Bright Sheng conducted Rising Moon with the Hong Kong Philharmonic, and the Indianapolis Symphony performed Cataclysm, which received the orchestra's Marilyn K. Glick Prize. Commissioned in 2013 by the St. Petersburg Chamber Philharmonic, Cataclysm was also performed by the USC Symphony in 2014. In 2013, Chasm was premiered by the Curtis Symphony Orchestra, and then subsequently selected by Robert Spano for a performance on the inaugural Aspen Composers Showcase. Daniel's earlier pieces Regenerations and Rolling River have also been performed by the Nashville Symphony, Buffalo Philharmonic, and numerous festival and collegiate orchestras. Jeffery Meyer conducts Cataclysm with the St. Petersburg Chamber Philharmonic. Daniel’s vocal and chamber works are also widely performed. In 2016-17, Daniel had premieres with the Tsanevski Quartet (Germany), the New England Piano Quartet (six-city China tour), and the Mirror Visions Ensemble (NYC), as well as the CD release of his work Blossoming, recorded by the PRISM Quartet for XAS/Naxos records. In 2017-18, Astral Artists has commissioned a new duo for violinists Nikki and Timothy Chooi, and the Weis Arts Center has commissioned a new work for double bassist Xavier Foley. Other projects include a violin concerto for Francisco Fullana, a song cycle for soprano Ariadne Greif, a chamber opera with writer Liz A. Johnson, and a new piano work for the Pennsylvania Music Teachers Association. Having trained in percussion and composition, Daniel was a fellow at the Aspen, Fontainebleau, and Brevard festivals, and he earned degrees at Curtis (A.D.), New England Conservatory (M.M. ), and the University of Southern California (D.M.A.). Daniel is a faculty member at the Walden festival in New Hampshire, and he has previously been a Lecturer at Rutgers and Bucknell. Daniel resides in central-Pennsylvania with his wife, pianist Qing Jiang. 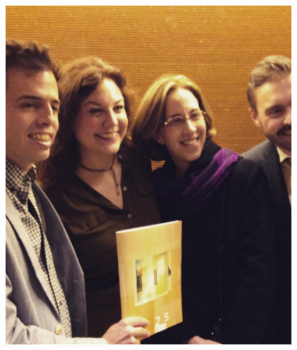 PRISM quartet premieres Blossoming in New York. (L to R) Dan with Vira Slywotzky, Peggy Kampmeier, and Mischa Bouvier of the Mirror Visions Ensemble. Jennifer Higdon (L), Dan (M), and Charles Fussell (R) at Curtis. Steven Stucky (Center-left), Stephen Hartke (Center-right), and the Aspen Gang. (L to R) Andrew Norman, Don Crockett, Dan, and Frank Ticheli at USC.